UNE University Archivist Bill Oates with one of The Heritage Centre’s own contributions to the Windows on Wartime exhibition. In wars, the drama of the frontline tends to get all the attention, but the work done on the “home front” has always been essential for supporting Australia’s war efforts. It is the home front that is the subject of the Windows into Wartime exhibition being hosted by UNE at The Heritage Centre, in the grounds of the Old Teachers College. The exhibition has been produced by the State Archives and Records Authority of NSW for the Centenary of Anzac – an event which marks 100 years since Australia’s involvement in the First World War. The Heritage Centre has also made its own contributions of diaries and other war memorabilia from its collections. Executive Director of the State Archives and Records Authority of NSW, Geoff Hinchcliffe, said the series of historic images captured by NSW government photographers during and immediately after the War depicts how communities across NSW worked together to support Australia’s war effort. 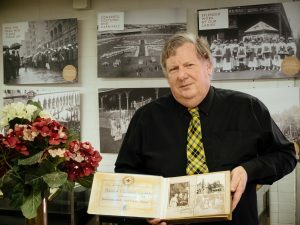 “This unique exhibition documents the variety of activities that took place on the home front including recruitment campaigns, the development of soldier settlement schemes, the establishment of the Red Cross in NSW, the infant health movement and patriotic fundraising activities,” Mr Hinchcliffe said. Exhibition Curator, Dr Penny Stannard, explained that new digital technologies enabled these images to be brought to life 100 years later from original glass plate negatives. “It has allowed us to re-discover and fully appreciate the technology of early 20th Century photography and the role that it played to capture our history,” Dr Stannard said. Minister for Tourism and Major Events, and Assistant Minister for Skills, the Hon. Adam Marshall MP said the Northern Tablelands made a significant contribution to the Great War, including heavy sacrifices that shattered the community. “The home front was active throughout in providing comfort, support and resources to the volunteers. This was continued with local assistance for returning servicemen and widows. Support was not just limited to highly visible soldier settlement projects established like Kentucky and Bective, but locally focussed and ongoing,” Mr Marshall said. PICTURED: UNE University Archivist Bill Oates with one of The Heritage Centre’s own contributions to the Windows on Wartime exhibition.